Christian Knatt, Wildlife Program Coordinator at the AEF, talks to a group of students about Bald Eagles and their role in the environment. World famous eagle Challenger acts as an ambassador for his species. Those words are as appropriate today as they were when Baba Dioum first spoke them in 1968 at the International Union for the Conservation of Nature and Natural Resources. In the 21st century, we are drowning in information, but lacking in wisdom. We need environmental advocates who can synthesize information intelligently, and present it in a way that is appealing and easy to understand. The American Eagle Foundation lists Education as one if its 4 pillars upon which its Mission is based. To accomplish this, we present our live video HD cams on several Bald Eagle nests, where adults and children can watch eagle families go about their daily activities while caring for their young. An online Chat is featured, whereby those watching the eagles can ask questions or share observations with others. This Chat is monitored by Moderators and Cam Operators—individuals immersed in eagle knowledge, who welcome and help inform those who visit. Our moderators also encourage teachers to set up a scheduled viewing time just for their class, so the students can ask all the questions they want in a friendly, welcoming environment. 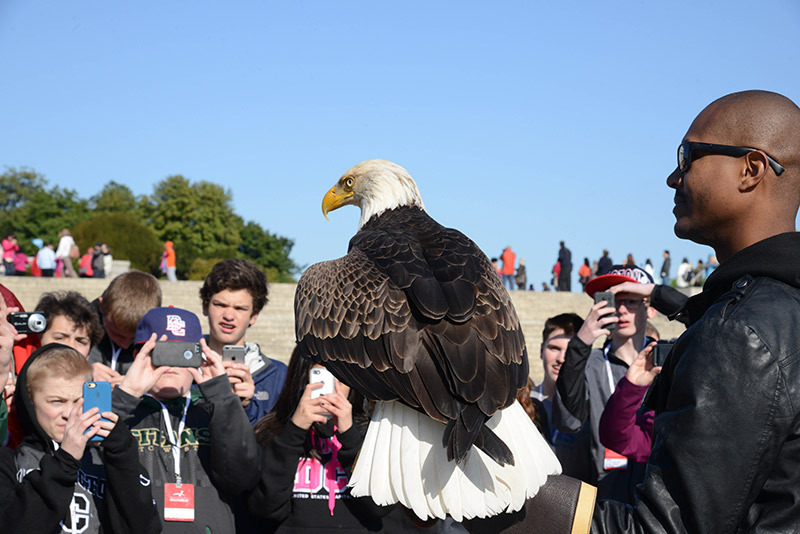 Our viewers can, without disturbing one eagle, see the lives of these magnificent creatures unfold from the comfort of their classrooms, computer rooms – or even their mobile devices. In addition, AEF carries its outreach programs into hospitals, nursing homes, classrooms, parks, and corporate events with Birds of Prey shows featuring many of our non-releasable raptors (the stars of the show.) The caregiver/handlers of these birds are knowledgeable and entertaining, and delight their audiences with stories unique to each bird and the species it represents. At Dollywood, our Wings of America birds of prey show has educated millions of visitors, while providing a fast-paced, always entertaining hour of fun. Challenger, the non-releasable, free-flying Bald Eagle has performed thousands of soul-stirring flights over stadiums and corporate events. He has inspired Senators and House Members; visited with the Secretary of the Interior, and even met United States Presidents. He has appeared on national TV shows and is undoubtedly the world’s most recognized Bald Eagle. Challenger continues to advocate for his species, raising awareness about the Bald Eagle and what it stands for. Those who have been fortunate enough to see him fly experience a feeling of pride and patriotism. It is up to every one of us to be torchbearers for the future; to speak for the animals; to protect the planet for generations yet to come.